Osvaldo Golijov (with me below) and Dawn Upshaw led the process and provided lots of helpful advice. Composer and Accordionist extraordinaire Michael Ward-Bergeman introduced me the multi-named instrument that has a remarkable propensity for cropping up in cultures across the globe, from Australia to Austria. It's built from beer bottle tops nailed or screwed in to a pole. Here's Michael playing one he built himself - I'm currently collecting tops for my own attempt - stay tuned! 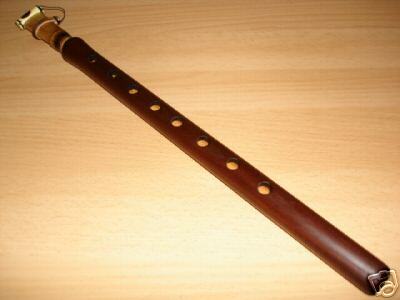 The joys of ebay - my newly ordered duduk has arrived. It's beautiful-looking and has a very distinctive smell (it's made from apricot wood). The reed seems enourmous in comparison to a clarinet reed - very long and very fat. It came with two of them - the first one seemed to go a bit wide after I ran the tap over it (as instructed in the helpful e-manual that came with it). First impressions are that it's a bit of a bugger to play, much harder than a clarinet, more like an oboe. But I love the untempered tuning - I'll try to put an excerpt up here once I've practiced a bit!